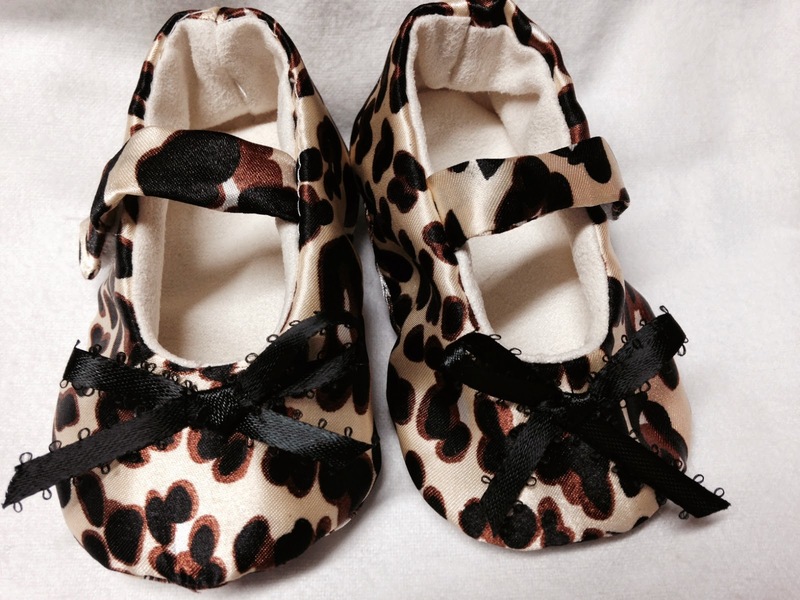 We are always looking to add to our product selections and this new shoe style can be used as a boy’s shoe or “glammed” up for a girl. 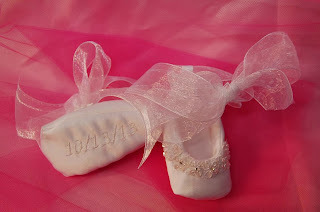 We think it would look adorable with a little cross embroidered on the toe for a christening shoe. We think they are just adorable! 2014 has begun! 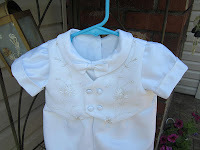 This look was created, along with matching shoes with date embroidered on the bottom, an embroidered bib with terry cloth backing and to keep Victoria warm, a curly minky jacket lined with mom’s gown. The gown was designed with ties in the back to ensure a good fit, although when we tried it on her, it fit perfectly! Mom was thrilled that the dress followed the design of her gown. We can’t wait for pics of Victoria from her special day. had a great time with Kristi’s gown, even though the beads and sequins were flying all over the place. 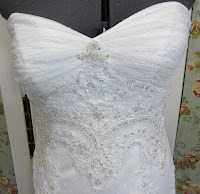 The bottom of the gown had such wonderful lacework while the top had beautiful beadwork. 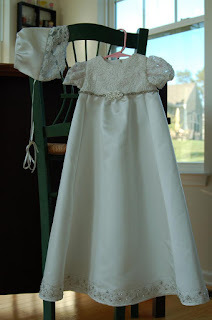 We agreed with mom that with all this going onto the bottom of the gown, less was more on the top. She also wanted just some small trimwork on the bonnet and of course the shoes finished it all off. Mom was also included in a You Tube video we are trying to put together, stay tuned! Ta da! We are so exited to announce we have launched our new website which contains more information about us and what we do as well as our pricing structure, products and contact information. A ‘shout out’ to my brother Richard for all the work he did for us on this site and especially putting up with his “control freak” sister. Another thank you for our mommies who let us post their baby pics on the web. Please go to our website and let us know what you think and check back regularly as we expand our available products for purchase! 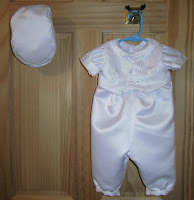 Jessica came to us with a wish to create not only a beautiful one of a kind gown for her daughter’s upcoming christening, but also, in the hopes of a son someday, a boy’s romper and hat. 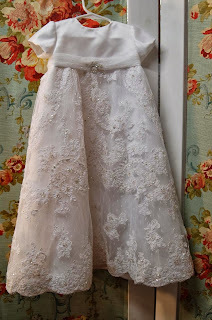 Jessica’s gown was organza with flower appliques and beading over a white lining type material. 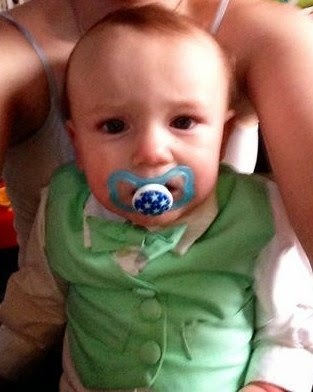 Because there was no satin, we had to supplement fabric for the bodice and for the boy’s romper. 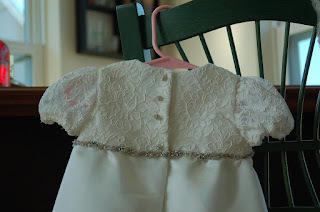 We used the organza overlay on the vest of the romper so it would all be tied in to mom’s gown. 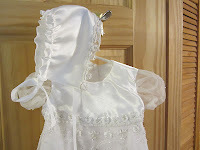 Mom ordered the bonnet in our open back style, the back closes with a ribbon so it can be adjusted to baby’s head. For the boy’s hat, she chose the newsboy style. 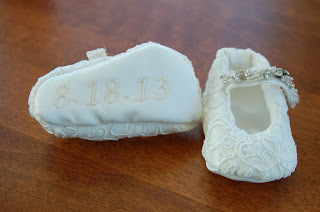 Of course baby had to have matching shoes with the christening date embroidered on the sole of the shoe. 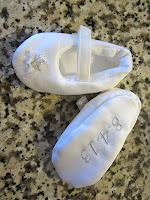 We sent extra fabric home with mom so when the time comes, the boy’s shoe can be made. 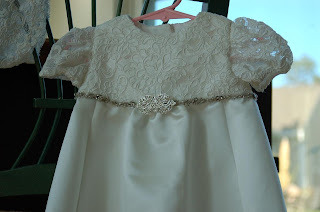 Mom’s gown came to us as lace covered satin, with silver embelishments, including little silver faux buttons. 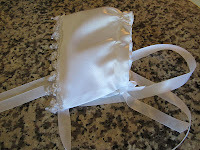 Instead of doing the “usual” with the lace on the bottom, we placed the lace on the bodice, with just the lace on the puffy sleeves. Since the bottom would be a little plain compared to the bodice, the beautiful silver trim from her veil became the silver trim on the bottom of the dress. This was handstitched on with invisible thread! 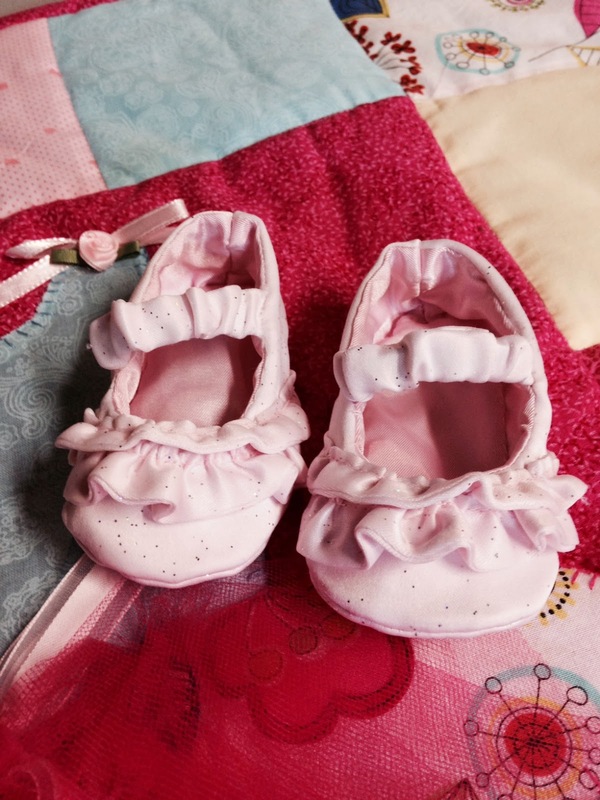 The bonnet had the lace trim and the shoes were done in lace covered satin with the date of the christening embroidered on the bottom.